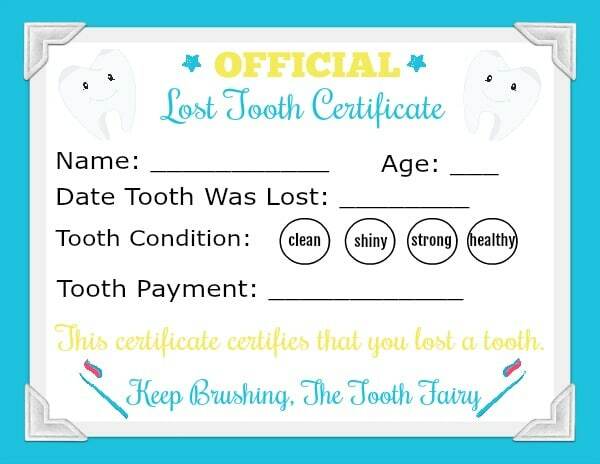 Every busy parent needs a Printable Tooth Fairy Letter to save time and still make a lost tooth special. Kids will be so excited to wake up and find this tooth fairy certificate along with a little bit of money! Losing a tooth is a big event for kids! It’s a great opportunity to make an otherwise ordinary day a little special (plus reinforce good dental hygiene at the same time). This Printable Tooth Fairy Letter is an easy way to accomplish both, and also serves as a keepsake. WHY LEAVE A PRINTABLE TOOTH FAIRY LETTER? My first reason for wanting to leave my kids a printable tooth fairy letter is because it makes losing a tooth even more special. It is kind of like receiving a letter from Santa. Kids love hearing from holiday figures. A tooth fairy letter is something that can be kept as a keepsake. You can put it into a scrapbook or it can even go into a baby book. Personally, I love something tangible that we can look back at years later. My last reason for leaving a printable tooth fairy letter for my kids is that it allows me to escape the whole process of trying to sneak the money under their pillow without waking them up. I can leave the tooth fairy certificate on the nightstand with the money or gift and it is easy peasy! SHOULD I LEAVE A PRINTABLE TOOTH FAIRY LETTER EVERY TIME? I think it is great to leave a tooth fairy letter every time my child loses a tooth. 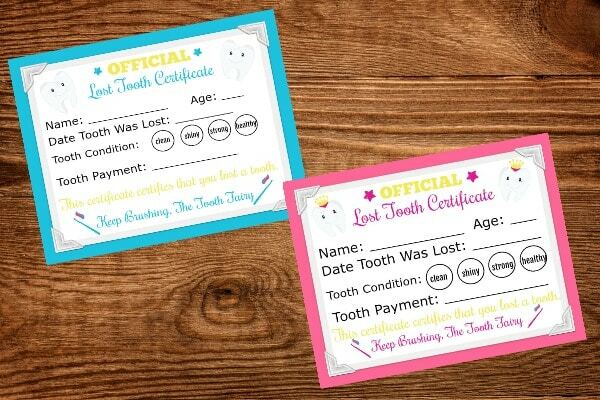 Each certificate includes the date and that helps you track when all of the teeth were lost! 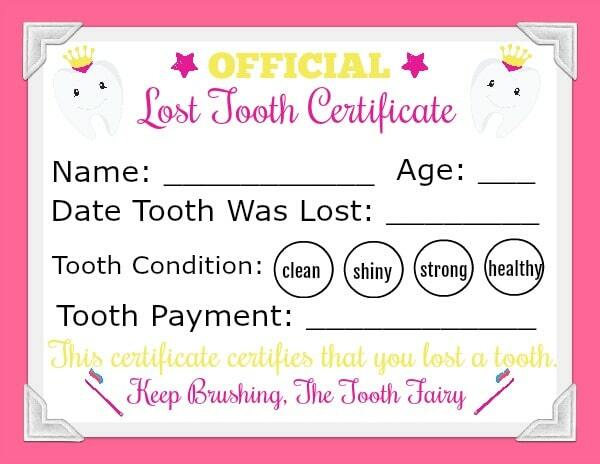 If you leave different amounts of money for different teeth it will also be documented on the tooth fairy certificate. 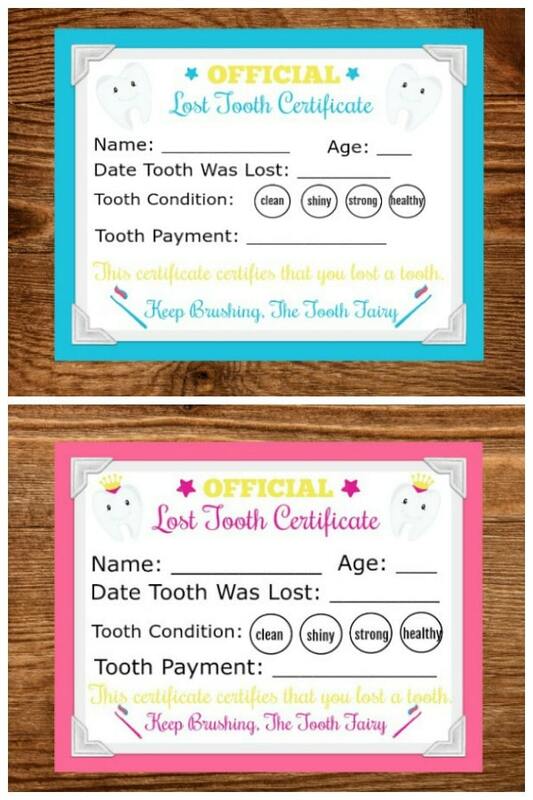 Using this free printable tooth fairy letter is one very EASY way to make losing a tooth special. Another way to make the lost tooth special is to get an adorable tooth fairy pillow . There are so many cute pillow options to choose from lately. Some of the tooth fairy pillows come with a notebook and a photo pouch. If you child just lost their first tooth you may want to read the book, The Night Before the Tooth Fairy , by Natasha Wing and Barbara Johansen Newman. This book really helps kids who might be a little bit wary of the tooth fairy. Another fun book is, You Think It’s Easy Being the Tooth Fairy , by Sherry Bell-Rehwoldt and David Slonim. Lastly you can buy a baby tooth album which has spots for you to keep all of the teeth and document when the teeth were lost and even put a picture of your child’s toothless grin. 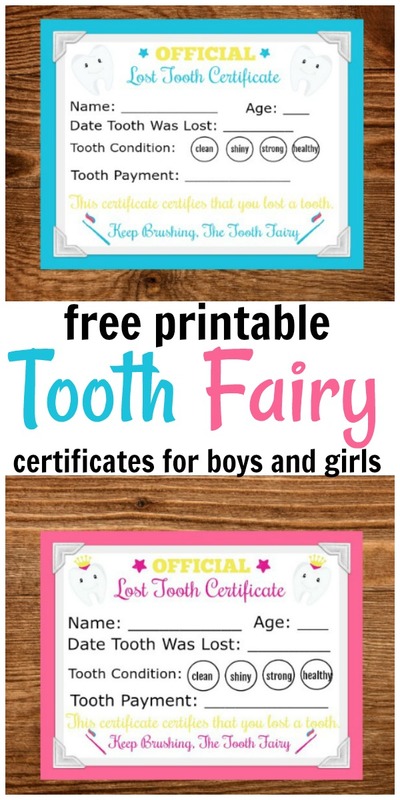 I have two different printable tooth fairy certificates available for you to download and print off for your personal use. One is geared towards girls and the other one towards boys. I always print my tooth fairy letter off on white cardstock so it is a little bit sturdier and will store better. Click HERE for the Pink Printable Tooth Fairy Letter. Click HERE for the Blue Printable Tooth Fairy Letter. HOW DO YOU MAKE A LOST TOOTH SPECIAL? What is your tradition for making a lost tooth special? I love to hear how other parents handle it. Do you like leaving a tooth fairy letter? Be sure to SHARE this post with your parenting friends so they can download and use the printable tooth fairy letter too.